yeah I liked Stephanie in that dress also.
. I woner who is responsible for choosing it every year. Wasn't it Grace choosing "themes" in the past? I read many times the themes was chosen by P. Caroline, don´t know if every year. I think she´s advised by the decorators. Has anyone found more pics from the 60s and 70s Rose Balls? i've noticed that the only photos of 92's Rose Ball posted inthis trhead simply are not available... I´ve some of these pics published then by Hola that i'll try to scan and post. Pss Caroline looks so sad in the photos... as if she were somewhere else but there. And indeed she didn't atend the 91's edition of the ball, obviously! Princess Caroline has a very beautiful face. She looks like her mother- Princess Grace very much. Thank you, Flowerpower for your work and photos!!! For me Charlotte is a little more beautiful than her mother. And she's brunette like me. But the most beautiful was Grace. Is it just me, PGrace had something special- even though she born american- she had royal persona about her-Like her parents knew it at birth to name her Grace---------I think Grace the name came from her father's sister or something like that. ^Aww she looks so beautiful there! She does! She always reminds me of Catherine Deneuve. Princess Grace did not have important jewels and wore loans. The most beautiful jewels were owned by Princess Charlotte and inherited by her grand-daughter Caroline (Cartier and Fringe tiaras). Charlène will certainly wear Princess Grace's favorite tiara we never saw anymore. Does anyone have pictures of the 1977 Rose Ball? 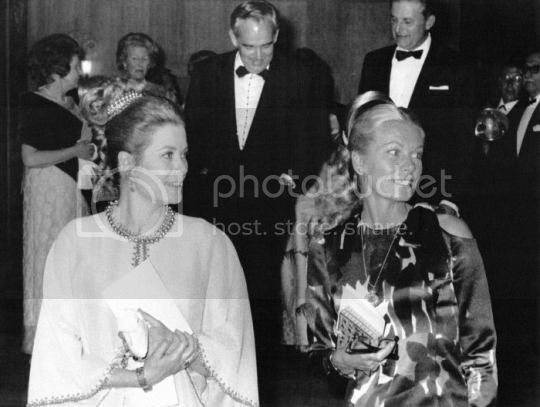 1969 Bal de la Rose: Princess Grace with her sister, Peggy.